This past week brought to mind one of my favorite literary quotes (yes, I do still remember a few things from college), by 18th Century British writer Mary Woolstencraft: "The ideal human existence is a continual back and forth between civilization and solitude." Amen. 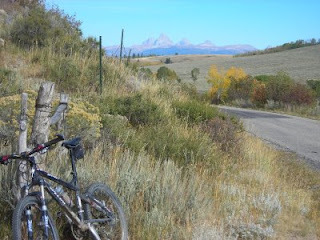 We get plenty of wilderness solitude around Driggs, and if you mix in occasional travel to the city you've got it covered. 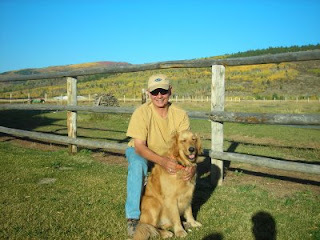 We've enjoyed nearly unprecedented fall warmth and sunshine around here recently. After such a late start to summer (we had snow every week through the middle of June, remember! 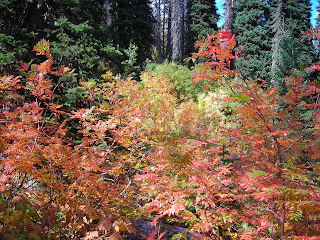 ), this Indian Summer finish has been savored by all. 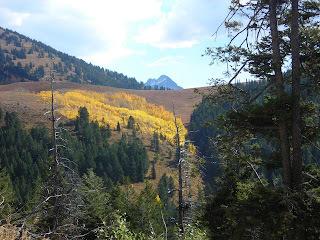 Hikes and bike rides, fishing on the Teton River, and even late season golf have all been stellar. I couldn't pass up this colorful photo, love the contrast with the evergreens. 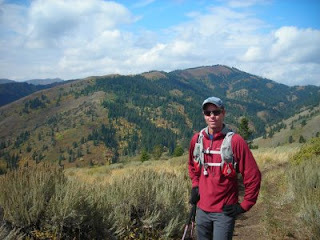 Joanne, Bridger and I did a great hike up to the Big Hole Crest Trail last week, just as colors were really kicking in. We typically access that trail via Corral Creek on our mountain bikes, but decided to go up via Grove Creek on foot for a change. This photo shows Red Mountain in the background, aptly named for the unusual red dirt found on its slopes (this isn't Moab after all, it's Driggs...but we do have a little red dirt around here). Eventually, work called and we headed west across the state to Boise (which is a 5-plus hour drive...Driggs is actually closer to Salt Lake City than it is to Boise). R.U. 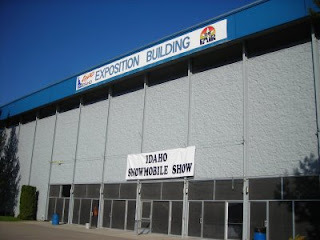 Outside was displaying at the Idaho Snowmobile Show, so it was a couple days of work before the playing could commence. It was great to hang out with my guys Andrew and Kyle who drove the trailer up from Logan ("the boyz"), plus nice to see lots of longtime industry friends. Hanging out with y'all Friday night at The Reef in downtown Boise was epic. Who knew the Violent Femmes would be back in so soon? College kids today share some of the same music tastes we had just a few, umm, years ago. 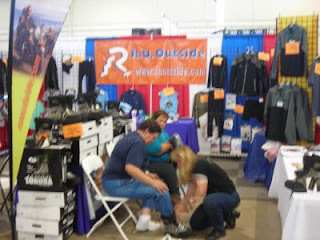 I know, it's blurry, but this pic shows Joanne hard at work selling R.U. Outside boots. This is the glamorous stuff that allows us to live in Driggs. We've been schlepping product and doing mail order/internet sales for seventeen years now, and our feet & backs can feel it :-) On a serious note, the show was good and the people were great. Nearly everyone in Boise seems to have a smile on their face. Maybe it's the Boise State football team (perfect record so far), or the perfect weather, or the fact that they live in a perfect-sized city that offers all the amenities without overwhelming crowds. Regardless, we loved it. 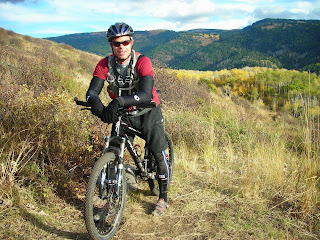 The show ended, and we joined our Boise buddy Aaron for a big mtn. bike ride in the foothills. 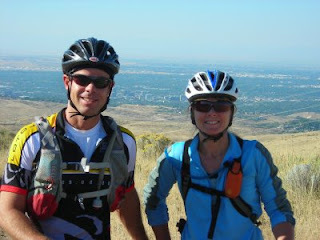 Boise is a metro area that truly "gets it," and boasts what is arguably the best urban-area trail system in the country. It started with their Greenbelt along the Boise River decades ago, and then spread to a plethora of candy-sweet trails in the foothills. 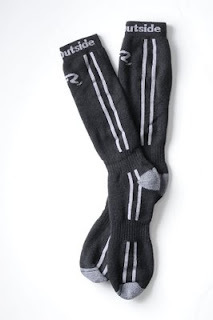 All together, it's called the Ridge to Rivers trail system, and it rocks. The soil is like beach sand, so it drains water efficiently and is ridable nearly year-round. 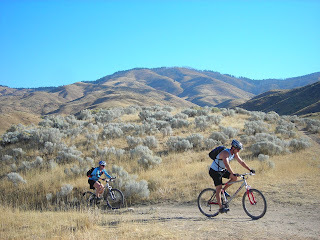 Yes, mountain biking in Idaho in December and January is a reality! Sign me up. Here's a shout-out to Aaron for the expert guiding, and photography. Thanks, man...Joanne and I went home with big ole' grins. I've said it before, and I'll say it again: if I ever return to city living, Boise is at the top of the list. 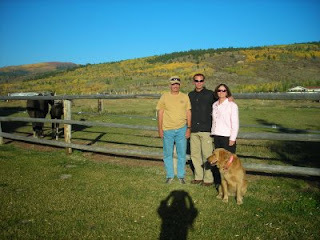 We made it home to Driggs just in time for mom and dad's last day in the area. 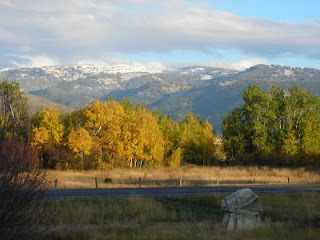 They always hang out in Jackson in late September, taking in the colors and the elk bugling in Teton Park. They're doing great, and it was awesome having them at the house for an evening of catching up. We gave them specific instructions to return again next year, and bring this perfect fall weather with them. I think it's a deal.